Peasents wore ragged clothes, because they did not have ehough money to afford better and more handsome clothes. Gentleman wore clothes with bright colours which made them stand out. They were richer, so they had better quality of clothes. 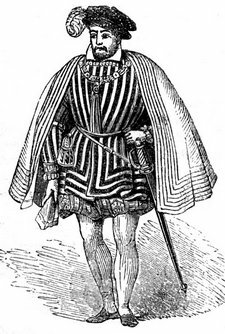 Nobleman wore shoes with metal points, tunics, under shirts, conical hants and ornamental mantel. They were much richer and bought better and welthier clothes. Churchman wore long gowns and had hats with christian ornaments on them.